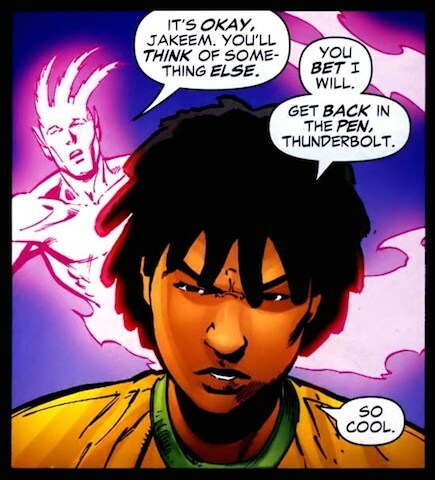 This week’s minorities in cartoons entry is Jakeem Thunder. Jakeem first appeared (under his original name “J.J. Williams”) in “The Flash” (vol. 2) #134 in February 1998. He was created by Grant Morrison, Mark Millar and Paul Ryan. Jakeem’s backstory states he grew up in Keystone City, the home of the original Flash (Jay Garrick) and the third Flash (Wally West). Jakeem came from a tough background (orphaned at a young age, etc.). He adopted a similarly tough attitude (including a foul mouth) in response. Meanwhile, longtime Justice Society of America (JSA) member Johnny Thunder found his mental health was in a state of decline. During this, he’d placed the Thunderbolt in a pen and forgot about it. Johnny subsequently gave the pen to Jay Garrick. At a later point, Jay encountered Jakeem, and gave Jakeem the pen, not knowing the Thunderbolt was inside of it. Anyway, soon the world found itself threatened by a rogue member of Thunderbolt’s race. Jakeem discovered that his pen contained the Thunderbolt, which he could control using the magic word “Cei-U” (pronounced “say you”)…which turned out to also be the Thunderbolt’s name (“Yz”) pronounced backwards. As part of this story’s revisions to the Thunderbolt’s backstory, it’s revealed that T-Bolt hails from the Fifth Dimension, the home of Superman foe Mr. Mxyzptlk. Joining up with other JSAers, Jakeem and the Thunderbolt helped defeat the threat. The battle saw the Thunderbolt merging with another similar being to form a new T-bolt, controlled by Jakeem with a different magic word (pronounced “so cool”). Jakeem then decided (reluctantly at first) to join the Justice Society as one of its junior members, and engaged in various adventures along with the team. Like Johnny, Jakeem also sometimes saw mishaps occur from poorly-worded wishes. Like many of the lesser members of the JSA, Jakeem seems to be a casualty of DC’s “New 52” reboot in 2011, as he’s yet to reappear. (For that matter, Johnny’s also gone missing, as well.) Jakeem’s also not appeared in any non-comics media to date.